Seemingly everyday a new printer in Belfast opens their doors. I imagine this is how every business feels with increased competition right across the board. Every new competitor means you have to step up your game, be the best at what you do. As I tell many of my clients, know your competitors, but donâ€™t focus on them, itâ€™ll zap your energy and literally youâ€™ll become a follower, not a leader. Competition is inevitable and for the most part completely out of your control. In our game there is always ALWAYS someone who will run a quick hit flyer printing offer or the same with a roll up banner. Most often than not itâ€™s unsustainable and the hit of clients they get means they let people down. Itâ€™s not good business practice. Especially for a sector like ours, where letting customers down means lost sales, revenue and profit. Thankfully weâ€™re not those guys! We as a business have always decided to focus on quality, competitive pricing and customer service. It puts us head and shoulders above many businesses and allows us to be the go to guys when someone needs design or print. We go the extra mile all the time and hopefully this has shown over the last five years. Well it must have, weâ€™re still here and growing. Now sometimes, customers come to us with projects that are just impossible to turn around. Do we send them away? No! We work with them to find a suitable solution so they can go about their business and concentrate on the harder stuff. Last weekend our long term customer @Doughzydonuts came to us with a little jam. The roll up banner they had been using for events was misplaced and at 2.30 on a Friday afternoon, they had just realised. What made this a sticky situation, was that the DD team had an event the next morning at 9.00am. Probably their biggest sales opportunity of the year. One that also meant a lot to them as they launched their business at the same event the previous year. Could not let them go unbranded? No we could not! Artwork was drawn up and the roll up banner printed and ready for 4.30pm. Kaizen Print save the dayâ€¦..again. Honestly though, it was a Friday afternoon and the Kaizen office was a hive of flyer printing activity. We put ourselves under the pressure to help out a client and friend of the business and if we can, do it for all our clients. 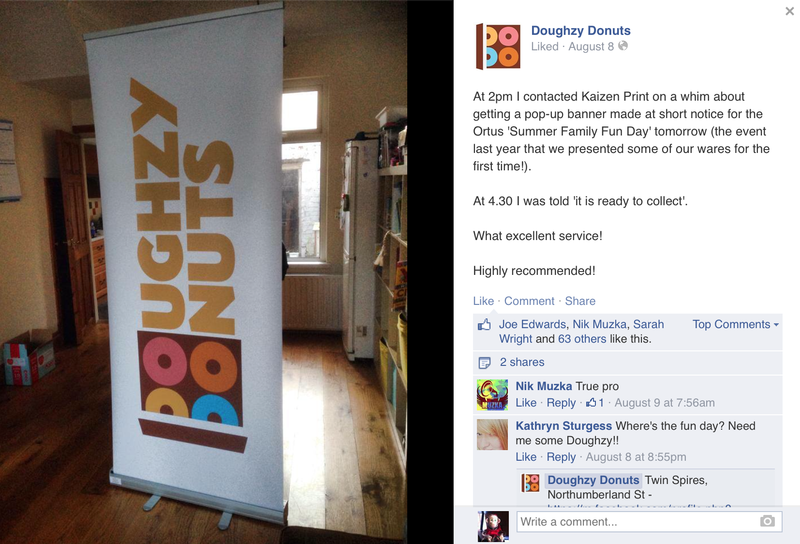 What made it ever sweeter (last pun I promise) was we got a lovely mention on the Doughzy Donuts Facebook page and many of our other clients chimed in to tell others know how great a company we are. That made my weekend.